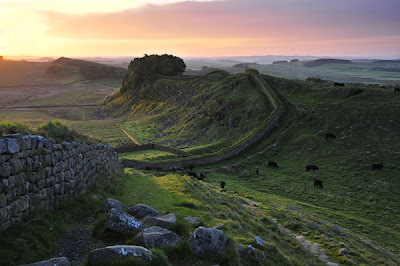 One of the most popular reasons for visiting the area from Hexham through to Haltwhistle is for Hadrian's Wall. It is an absolutely stunning part of Northumberland and to reach the most famous parts of the wall you need to head West, further inland from Hexham along the A69 towards Haltwhistle. 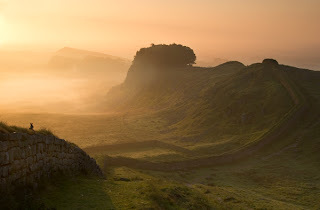 The most popular attractions along this stretch of Hadrian's Wall are the Roman Vindolanda and Roman Army Museum which are both run by the Vindolanda Charitable Trust (separate sites) and Housesteads Roman Fort and Chesters Roman Fort both of which are English Heritage sites. The area offers a fascinating glimpse through history, many beautiful small Villages and Towns to explore, excellent walking and cycling opportunities and a friendly welcome from the locals. Buy a Northumberland Guide. The information below covers the parts of Hadrian's Wall in Northumberland, there are other Roman Forts and attractions in Cumbria and Tyne and Wear. 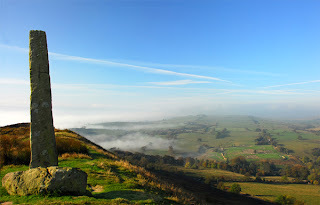 Visit our Hexham and Hadrian's Wall accommodation page for a range of hotels, B&B's and self catering. Run by the Vindolanda Trust the Roman Army Museum is just outside Greenhead (marked far left in blue on the map above) and the Roman Vindolanda is just North of Bardon Mill (marked second from the left in blue on the map above). The Roman Army Museum is based at the site of Carvoran Roman Fort and situated next to a glorious stretch of Hadrian's Wall. Often Museums attempt to bring history to life and I can honestly say that the Vindolanda Trust have done an amazing job here that includes objects excavated along Hadrian's Wall and an exclusive 3D Edge of Empire film that must be seen. It is a modern museum that will excite and educate with it's 3 different galleries, each exploring a different aspect of the Roman history. Postcode for your SatNav: CA8 7JB. The Roman Vindolanda is one of the North-East's key sites of historical interest and home of Britain's 'Top Treasure' the Vindolanda Writing Tablets. Here you can explore a Roman Fort like nowhere else and there is often live excavation going on when you visit. The Fort was occupied for over 300 years and was the first Roman frontier in the North and lies just South of Hadrian's Wall. In the museum you can see the extraordinary Vindolanda Writing Tablets, tiny thin slivers of wood covered in ink writing, a fascinating glimpse into the past. Postcode for your SatNav: NE47 7JN. This is the part of Hadrian's Wall that I remember fondest from my childhood, the excitement of the small museum on entry and walking on the great wall. I also remember falling off said wall while holding my dad's new and expensive camera, but that's another story entirely! This is the only stretch of the Wall that you are allowed to walk on, as it is a scheduled ancient monument it is illegal to walk on the vast majority of the Wall. This is arguably the most popular part of Hadrian's Wall to visit and walk from, the panoramic vistas are simply stunning. The fort is perched up high on a ridge and is now the most complete Roman Fort in Britain and is the ideal place to experience how the Romans lived. If I was forced to choose one place on Hadrian's Wall to visit above all others then it would have to be Housesteads, English Heritage members enter free, visit their website for more information. Postcode for your SatNav: NE47 6NN. Almost 2,000 years ago Chesters Roman Fort was built as an army garrison to protect the nearby bridge that crossed the River Tyne and is now widely accepted as the best preserved Roman Cavalry Fort in the Country. There is lots to see and do here as you wander the fort with the preserved baths and steam room, collections of items found in the excavation, the restored Victorian museum and the fantastic viewing platform of the Roman bridge and the river. Chesters Fort, like Housesteads is looked after by the English Heritage and members enter free, visit their website for more information. Postcode for your SatNav: NE46 4EU. Visit the fascinating remains of a Roman garrison town, here you can explore the granaries, markets, workshops and temples and learn how the Romans lived. The first Fort was built in Corbridge around 85AD and some point in the second century it was replaced with a town, the remains of which you can now visit. A large number of items that were found while excavating the site are now housed within the museum. This is an English Heritage site, so access to the remains of the town and the museum are free if you are members. It's easier to see the layout of the town from above, the picture on the right is a google satellite image showing how large the site is. The building to the left of the picture is the museum. Corbridge Roman Town is located just outside the town centre, to the West on the banks of the river. For more information visit the English Heritage Website. Postcode for your SatNav: NE45 5NT. 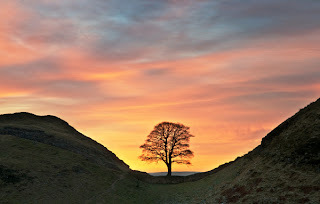 An absolutely beautiful spot a pleasant walk West from Housesteads Crag is Sycamore Gap. It was made famous by the film Robin Hood: Prince of Thieves and if you've seen the film you no doubt recognise the picture to the left. This walk from Housesteads is my favourite part of the Wall to have a short walk along, the scenery and panoramic views just can't be beaten. Another English Heritage site, Brunton Turret is about quarter of a mile south of the Hamlet of Low Brunton of the A6079 which is close to Chesters Roman Fort. It's one of the few surviving pieces of turret left on the Wall, stands at 2.5 metres tall and was built by men of the Twentieth Legion. 'Walking the Wall' as it has become known is very popular in the warmer months of the year and the Hadrian's Wall Path National Trail stretches the whole 84 miles of the Wall. In winter the paths can become eroded and difficult to walk, so other routes that explore the museums and surrounding countryside are encouraged at that time of year. Between May and October the National Trail runs a 'passport' that allows you to collect seven stamps along the way from 'stamping stations', you can then collect a completion badge and certificate to prove you have walked the wall! Passports can be ordered on the National Trail website. A fairly recent addition is Hadrian's Cycleway and it has quickly established itself as one of the top long distance cycle paths in the Country. It runs from the Roman Fort of Arberia in South Shields, right through Northumberland and finishes in Ravenglass on the Cumbrian coast some 174 miles away. It is a National Cycle Route (Number 72) and mainly runs on quiet country lanes that pass close by all the sights and attractions listed above. Cycle shops close to the route in Northumberland (should you need them) include Activ Cycles in Corbridge. The absolutely stunning photographs shown on this page belong to Joan Thirlaway, more of her beautiful pictures can be seen by visiting her website After the Rain or click on any of the images. We are very grateful that she has allowed us to use these special images.